Det. Villeneuve has been a member of the Ottawa Police Service since 2002, he transferred into the High Tech Crime Unit in 2008, now the Computer Forensics Unit, as a computer forensic examiner. He does forensic analysis on PC, MAC computers, cell phones, and any other device capable of storing data. He has analyzed over 1000 devices for crimes ranging from theft to homicide. 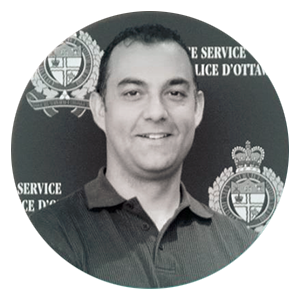 He assists on search warrants and prepares detailed reports for the courts on his findings. He has been deemed an expert in the field in provincial and superior court in Ottawa, Cornwall, Brockville and Morrisburg.